Notes: Lost Spirits Distillery is probably one of the most amazing distilleries I have ever visited. I had the chance to vista there a few years ago after Bryan (Davis) and Joanne ( Haruta) moved back to the states after selling their distillery in Barcelona which produced that wonderful Obsello Absinthe and Barcelona Gin a few years ago. Since then he moved to Salinas California and had been producing some amazing whiskies such as Leviathan I, II and III and Bohemian Bonfire, both ultra smoked whiskies produced in an extremely unique hand built still, another absinthe that we have not tried yet and now this Rum. This rum is very unique on a number of counts. It is produced in a handmade copper pot still of Bryans own design for a start and the ingredients are quite singular also. Lost Spirits uses an older style of fermentation which deprives the yeast of nitrogen and stresses them to produce unique flavor compounds that when combined with other elements of fermentation and distillation produce a rum with less of the high alcohols that give its sisters The Naval Rum with a heavier taste and mouthfeel ( think a dark heavy rum style like say Diplomatico Reserva Exclusive if you have not had the Naval Style , or sadly cannot find it) , and the Cuban Inspired Rum somewhat lighter in body similar but different than a Puerto Rican Style rum like Don Q, with are lighter than this beast , the Colonial American Inspired Rum. 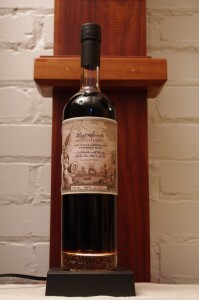 The rums produced by Lost Spirits were prototypes and proof of concept for a new type of accelerated aging process using high energy photons (rather than the usual approach of using pressure,heat and a hyperbaric chamber of some sort) bombarding the rum and wood to produce compounds ( and results) that closely resemble a 20 year old rum in profile ( as in gas chromatographic profile not just taste). This rather simplified explanation of the process and the careful but accelerated aging in multiple wood types, artful blending and meticulous care produce a portfolio of rums of very distinctive taste and appearance. I would also like to point out that Lost Spirits does not any coloring or flavoring additives, unlike many in the industry. It comes by its color and bountiful flavors honestly – not from a chemical vat and tweaking colors with additives. Lost Spirits has recently taken the wraps off their aging machine and we cover that story ( with pictures) here. Appearance: Clear dark amber/caramel color similar to cooking maple syrup. A deep, rich, promising color that reminds me of a Jamaican style heavy rum of long aging. First Impression: Heavy molasses, alcohol, cinnamon, dark fruit, bananas, figs, and leather with touches of Erinmore flake tobacco and lighter notes of allspice and berries. Taste: Heavy, sweetish,then rapidly warming with blackstrap molasses, cinnamon, burnt sugar/caramel with seems a big dose of smoke and peat, barrel char and leather. Nicely lingering finish with a fair amount warmth and spicy complexity. Drinks: Great in a Zombie, Hurricane or any cocktail calling for a heavy and slightly rustic sort of rum. Holds its own against any other ingredients you throw at it without overwhelming the cocktail. Speaking of which, remember this is 124 proof – so don’t overwhelm your guests – adjust recipes a bit so they can still find their hands and feet after a few cocktails using this rum. Bottle: Heavy crystal type glass choice leads to s nice almost sparkling, clear glass bottle cylindrical brandy style in overall shape with a notably heavier clear glass foot to it givng it a more prestige look and superior balance. Other: No artificial colorants or additives. Also flammable – so watch the open flames and smoking materials.